"Adding Beauty and Value to Firearms With One-Of-A-Kind Design"
Upon your request we will produce a legend in memory – Hand Carved in Steel – that will live to see and be seen by generations yet to come. It could be the cheapest firearm ever produced, but after being engraved with love and respect, it will immediately become a long-life memory of days that have gone, but are far from forgotten. Carved, not in stone or wood, but in a body of steel created by the united workers in our United States, or from another part of the world, your ideas become a “Stories In Steel” original. 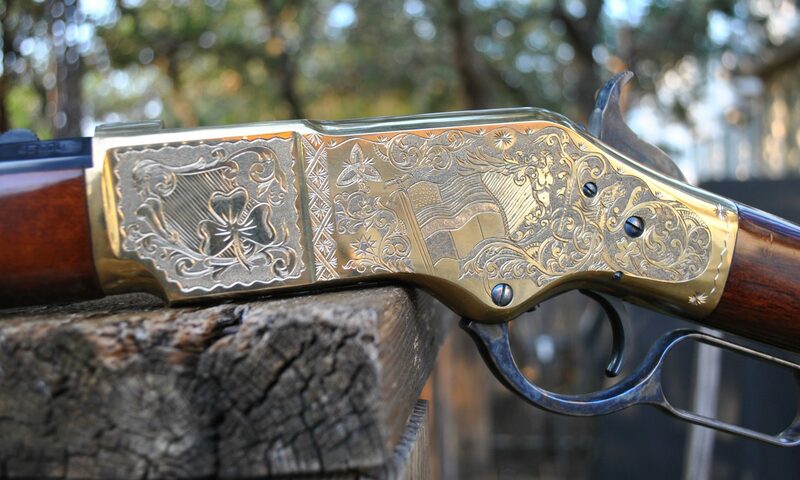 The desire to embellish that special firearm often reflects one or more dispotistions; it might be the appreciation one has for uniqueness or, the desire for adding a personal touch, it may even be the need for that one-of-a-kind gift to mark achievement. Regardless of your intent or the reason, the goals of Stories in Steel is to provide our clients with premiere engraving services that support a positive experience from start to finish. The origins of Stories in Steel has its’ beginning in the Celtic Arts of Mother Ireland, where the McVicker Family ran a commercial letter press printing business in Belfast, Northern Ireland. Needless to say, everyone in the family had their share of work and responsibilities. Séan was capable of hand-feeding and running colour printing presses at the tender age of 12 years. His Father had him indentured as an apprentice compositor, in typesetting by hand, and graphic design. Part of Séan’s training in the Affiliated Arts Program included commercial engraving. This involved five years of practical work in letter press and attendance at the Belfast Technical College of Art, which meant that all report cards and progress were being monitored by the Guild of National Graphical Arts of Great Britain. Séan received his Masters’ Degree and Gold Medal for Contemporary Arts. Séan became a member of the City and Guild’s of Great Britain and a registered member of the National Typographical Association. The image of American Western Movies, Western Art and Western Engraving was too strong, so taking the advise of a very famous man, who is reported as saying: “Go West Young Man” Séan took this saying to heart and immigrated to the United States of America in 1978 to study Western Style Engraving and establish his engraving business, and so was born “Stories in Steel”. Stories In Steel is tailored to be personal, professional and based on a one-of-a-kind design approach. Whether the style of engraving is Banknote, English, Western or Nimschke, organizations such as the Texas Rangers (Texas DPS), the Former Texas Ranger Foundation, Texas Southwestern Cattle Raisers Association (TSCRA) and TSCRA Special Rangers, The Eiteljorg Museum, The Gene Autry Museum, the U.S. Marine Corps, and NRA (National Rifle Association), to mention a few, are venues that respect Séan’s talents as being true to the many generations that came before him. oh Lord so very far away. so strong the will to carve the gun. and then one day it came at last. a legend born “Stories in Steel”.